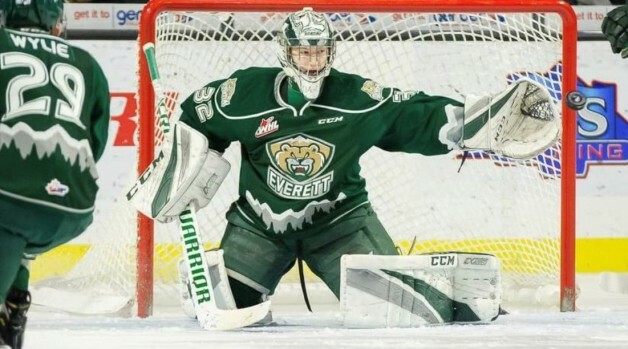 The Western Hockey League (WHL) announced today that Everett Silvertips goaltender Dustin Wolf has been named the Western Conference Scholastic Player of the Year. In his second season in the WHL, Wolf enjoyed a career year, registering a record of 41-15-2-2 with a 1.69 goals-against average, .936 save percentage and seven shutouts in a career-high 61 appearances. The Tustin product and Los Angeles Jr. Kings graduate excelled in the classroom as well, maintaining a 100 percent average for the current academic year, as well as an overall average of 98.8 percent for his high school years. In Grade 12 courses, Wolf achieved perfect grades in English 12, Statistics, Economics, and American Government. Ranked 17th among North American goaltenders by NHL Central Scouting for the 2019 NHL Draft, Wolf was originally selected by the Silvertips in the fifth round (104th overall) of the 2016 WHL Bantam Draft. In Aug. 2018, Wolf represented USA Hockey at the Hlinka Gretzky Cup.